Note: This piece - my first-ever publication - was published in the Philippine Star's Lifestyle section on July 20, 2003. Istak. Dalin. Padre Jose. How can I ever forget the names of those people whose world I visited as I read F. Sionil Jose’s Po-on? That world, as I discovered, is no different from my own. 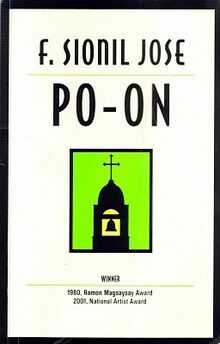 Even though what Po-on brings to life are the plowing of the fields, the tolling of the bells, and the firing of the guns; and in our world today what we do is send text messages, watch TV, and play computer games, there is one thing that makes Po-on strikingly familiar – it’s the people in it, Filipinos. Set in the late 19th century, Po-on, tells of a bright youth named Istak, who goes in exodus from Ilocos to Pangasinan with his family. But not only that, for it goes deeper in dealing with philosophy and nationalism. It also goes lighter, for it is also a story of love and friendship. You will at once be transported into a world where life and death are at the hands of the Spanish guards; where a parish priest rules the land and oppresses the people. The novel, with all its adventures, joys, and tragedies, ends with three words "Duty, Duty, Duty" – calling to mind the importance of the message. I am an avid reader. I really am. But even though I’ve read Tolstoy’s War and Peace, I still can’t picture the French and the Russians fighting the way they are described in the book. I haven’t been to France, I haven’t been to Russia. How would I understand Laura Esquivel when she tells of a Mexican dish of which I have no idea how it tastes or looks? True, literature transcends languages and cultures. But it’s much easier if the author speaks of things you have seen, you have heard, and you have felt. For when I read about bamboo trees, nipa huts, the fields, and the rivers where you can bathe, I only have to remember the last time I saw grandmother in her old, wooden house in the province and everything comes to life. And when Sionil Jose writes of poverty during the Spanish time, I only have to look around and feel the poverty of our time. Po-on bears a message that deals with the question of our identity as Filipinos. In the end, Istak understands that love for country, which involves sacrifice, is essential to discovering the meaning of his own existence. He died (to my great sorrow) but he gave honor to the country by proving to the Americans that Filipinos are capable of many things. Of course, today we are not being invaded by a foreign nation, but we still have many wars to fight. There is the war on poverty, and the never-ending struggle for national unity. It seems that no one has the answer to how we can ultimately end corruption and crime, but Po-on clearly tells us that the only thing lacking in us is self-sacrifice. We need not die like Istak did. By not grabbing our nation’s wealth, politicians make a sacrifice. And by working hard – all of us – even before we see the dawn descend in our land, we too, make a sacrifice. Personally, the novel means a lot, too. As a teenager I found out the most important and most beautiful characteristic a woman can possess: devotion. This was exemplified by Dalin when she saves Istak’s life. In the novel, faith, hope and love are shown by the characters as though it’s all very simple, and they do this despite their poverty and own weaknesses. When I realized how much I was moved by Po-on, I felt a mixture of guilt and regret. For, before reading Po-on, I have read more than a hundred books, and among them, only two are written by a Filipino – Noli Me Tangere and El Filibusterismo by Jose Rizal. And I only read them because my Filipino III teacher told us so. Actually, my reading Po-on was only out of curiosity: It’s required of the first-year students in my school, and my literature teacher said it’s good. And when I read it, I liked it, and it eventually became my favorite book. Now, having been enlightened by Po-on, I’m going to check out more works by our own authors. Not just by F. Sionil Jose – we have a lot of literary geniuses: N.V.M Gonzales, Bienvenido Santos, Nick Joaquin…the list goes on. Don’t get me wrong: Hemingway I admire; Garcia-Marquez I revere. But it is the likes of F. Sionil Joses whom we must patronize the most. For they write about us – our past, our present, our future. Our people, our culture, our world.